Power your Mac or PC, charge your mobile devices, connect fast external drives and other USB accessories, a 4K display, and much more with a single cable. 5 USB 3.1 Gen 1 (2 high-power charging ports, 1 USB-C port) allow you to reconnect and charge devices, the Gigabit Ethernet, HDMI and combo audio ports combined with an SD card reader allows for even more connectivity. 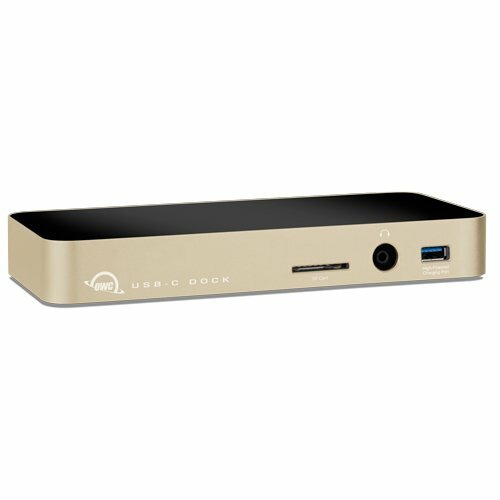 The OWC USB-C dock provides up to 60W to charge your computer through the USB Type-C Computer Link port. Software Requirements: Mac: OS, OS X 10.10 or later. Boot Camp is supported. PC: Windows 10 or later. Driver: Ethernet driver required for OS X 10.10 and 10.11 only. Driver not required for Windows. Hardware Requirements: Mac or PC featuring USB Type-C interface. Bootability: USB 3.0: OS X 10.10 or later. GbE: OS X 10.10 or later. Interface: (1) USB 3.1 Gen 1 Type-C. Device Ports: (2) USB 3.1 Gen 1 Standard-A (2) USB 3.1 Gen 1 Standard-A high power (1) USB 3.1 Gen 1 Type-C (1) HDMI 1.4b (1) SD Card Slot (1) Gigabit Ethernet (1) 3.5 mm Audio Input/Output Combo. Display Support: HDMI 1.4b with support for up to 4K/30Hz. SD Card Support: SD, SDHC, and SDXC cards up to 2TB. Support for UHS-1 up to 40 MB/s. Power Supply: External UL-listed universal auto-switching power supply. AC input: 100-240V, 50/60Hz. DC output: 20V, 4A. Devices that require more than 60W may charge slowly or not at all. The Apple SuperDrive is not currently supported through the USB-C Dock. Driver is NOT required, nor recommended for macOS 10.12. A built-in USB-C connection is required to use the HDMI port on the dock. The HDMI port will not function if the USB-C connection on the computer is provided by a PCIe card. The USB 3.1 Gen 1 Type-C port does not support video signals or video adapters. Only the HDMI port can be used to add a display, by connecting an HDMI 1.4b compatible screen. Devices that require more than 60W may charge slowly or not at all. Backed by the OWC 2 year warranty and 24/7 customer support. MacBook Pro (13-inch Touch Late 2016) (October, 2016) Model ID: MacBookPro13,2: 2.9GHz, 3.1GHz, 3.3GHz; MacBook Pro (13-inch Retina display Late 2016) (October, 2016) Model ID: MacBookPro13,1: 2.0GHz, 2.4GHz; MacBook (12-inch Retina Display 2016) (April, 2016) Model ID: MacBook9,1: 1.1GHz, 1.2GHz, 1.3GHz; MacBook (12-inch Retina Display 2015) (April, 2015) Model ID: MacBook8,1: 1.1GHz, 1.2GHz, 1.3GHz; PC Laptops: Compatible with Windows/Chrome OS/Linux based PCs with USB Type-C ports.